Dul gro-Shug is an Orc rogue living in the southwest section of the Elven Gardens District in the Imperial City. He is a basic trainer in Light Armor, even though he claims to teach Security. Dul certainly takes it easy in life and spends most of his time relaxing in his house or hanging out with his friends Wumeek and Geem Jasaiin. He wakes up every day at 6am, heads downstairs, and spends the next eleven hours wandering around, offering training to anybody who might stop by. At 5pm, he leaves his house and spends an hour at his favorite bar, The King and Queen Tavern, before heading back home for dinner at 6pm. After two hours of eating, he once again heads for the tavern to meet up with his two buddies, to socialize, and to drink with the other regulars. At 11pm, he heads back home and goes directly to bed. On the 23rd of each month, he gets out of bed at midnight and begins his long walk towards Skingrad. He crosses the Talos Bridge and heads south on the Red Ring Road, before finally hitting the Gold Road for the rest of the trip. He arrives in Skingrad at 10am the next morning and checks in at the Two Sisters Lodge. Until his departure at midnight on the 25th, he will pay Hammer and Tongs and the owner Agnete the Pickled a visit every day between 8am and midday and spend the rest of his time at the Lodge. During this trip, he will offer training 24 hours a day. He is equipped with a chainmail cuirass and greaves and wears a pair of thick cowhide shoes. When he's asleep, he will unequip his armor and change into a more comfortable brown shirt and linens. He is armed with an iron war axe and carries around his house key, and a leveled amount of gold. In combat, in addition to his axe, Dul can use a leveled Illusion spell - either Invisibility, Chameleon, or Silence. When you approach him for the first time, he will politely introduce himself and give you a piece of misleading information: "Dul gro-Shug. I could show you a thing or two about Security [sic]... for a small consideration." When asked about the Imperial City, he'll point you towards two other trainers in the same district: "You just have to know the right people. Look up Ida Vlinorman and Othrelos in the Elven Gardens. They're the right people." The townsfolk of the city often discuss Dul's skills: "If you want to learn more about light armor, you might talk to Dul gro-Shug. ", "Dul gro-Shug always seems at ease in light armor. He moves well in it. ", "Do you know Dul gro-Shug? I understand he's good with light armor." and "Have you ever spoken to Dul gro-Shug about wearing light armor?" Dul is supposed to spend a full six hours in The King and Queen Tavern. He heads home for dinner because the AI package that controls his meal tells him to head for his Editor Location rather than his Current Location. 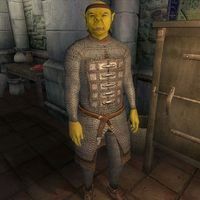 His trip to Skingrad is supposed to begin at 8am on the 23rd rather than at midnight, but there is a bug in the way the game handles such AI packages that affects many NPCs.